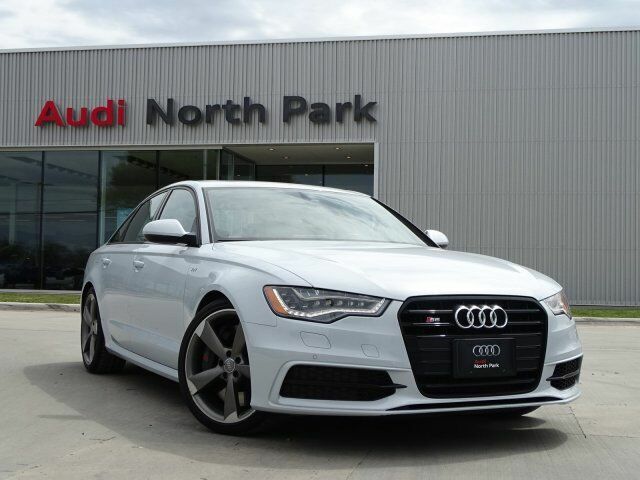 Audi Certified, CARFAX 1-Owner, LOW MILES - 39,328! JUST REPRICED FROM $37,995, PRICED TO MOVE $800 below NADA Retail! Navigation, Moonroof, Heated Leather Seats, All Wheel Drive, Rear Air, BLACK OPTIC PACKAGE, Turbo Charged CLICK ME! Leather Seats, Navigation, Rear Air. Audi Prestige with SP39 exterior and IM interior features a 8 Cylinder Engine with 420 HP at 5500 RPM*. BLACK OPTIC PACKAGE Wheels: 20" Titanium 5-Arm-Rotor-Design, Tires: 255/35R20 Summer Performance, High Gloss Black Pkg w/Exterior Body Color Mirrors, FULL LED HEADLIGHTS W/LED DRL'S daytime running lights and static cornering lights, and user programmable. MP3 Player, Sunroof, All Wheel Drive, Remote Trunk Release, Keyless Entry, Child Safety Locks, Steering Wheel Controls. Reduced from $37,995. This S6 is priced $800 below NADA Retail.